Property or Shares: Where Should You Invest? Property or Shares: Where Should You Invest? Investing in property or shares are the 2 most common ways of building wealth in Australia outside of superannuation. The topic of whether to invest in property, shares (or both) often leads to heated debates, since the 67% of Australians who own the house they live in are usually passionate about their investment decision. 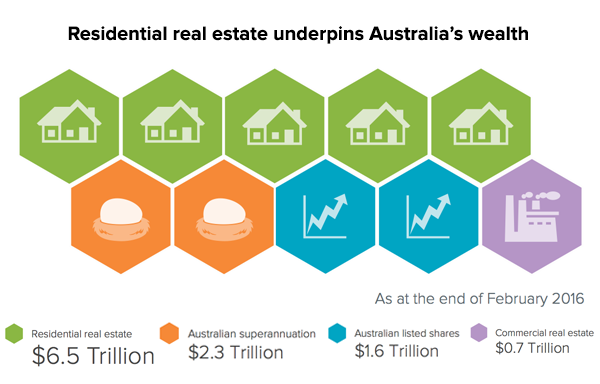 Shares and real estate have both generated reliable income and capital returns for Australians over the long-term. 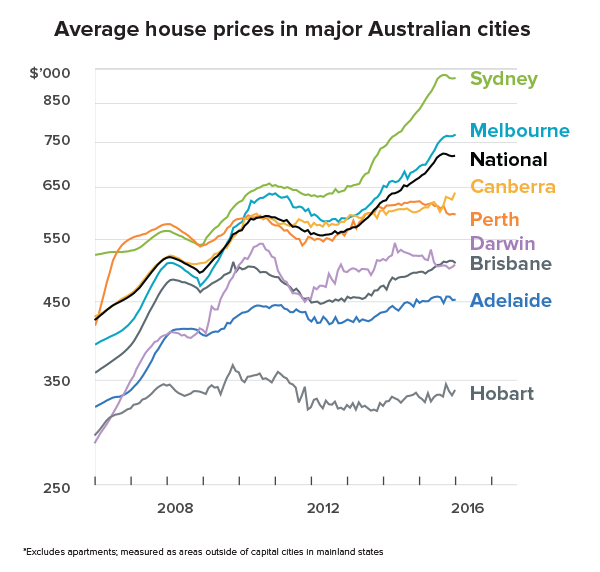 Property and shares are rarely out of the news, with weekly predictions about Australian property bubbles and busts fueling speculation and creating confusion for the majority of investors. Against this tide of information overload, it is important to remember that there are advantages and risks associated with both property and share ownership. Historically, there has been a belief in Australian culture that home ownership leads to an improvement in living standards, representing a symbol of success and security. Since 1961, home ownership has been relatively stable at around 70%, with a decline in recent years to 67% due to stretched affordability. Home ownership tends to increase with age, alongside general increases in wealth. However, recent analysis has shown a rise in the proportion of renters, as buying a home become less affordable due to rapidly increasing prices. Both Sydney property prices and Melbourne property prices have enjoyed strong growth between 2012 and 2016. Despite recent price rises, there are significant risks associated with taking on a large mortgage including interest rate risk and lack of diversification. Australia has one of the world’s highest share ownership rates, with around 36% of adults owning shares outside of their superannuation. Owning shares doesn’t typically bring the same level of personal attachment when compared to property, since the part-ownership of a business is less tangible than that of a physical house. Notwithstanding, shares have generated reliable income and returns for Australians over the long-run. 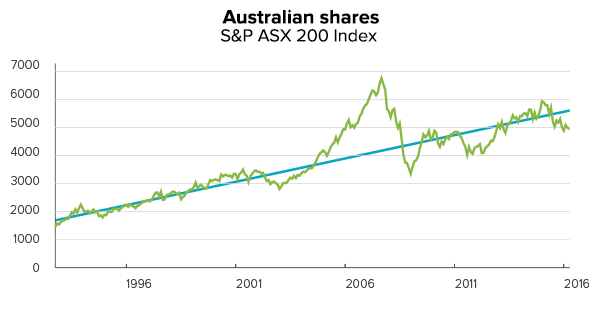 Over the 30 years to 2015, Australian shares have generated an average return of 10.8% per year including dividends. In the past 5 years, Australians investing in shares have increasingly turned to diversified products such as Exchange Traded Funds (ETFs) to reduce the risk of investing in single shares and provide access to international markets. There are many factors to consider before making a decision on whether to invest in either shares or property (or both). Your budget for living and investing has limits. Look at what you can afford and test different interest rate scenarios before making a major investment decision. Compare whether you would be better tobuy or rent. What is your attitude to share market movements? Would you have the discipline to stay invested even during periods of market volatility? How stable is your income? Would you be able to continue paying a mortgage if something changed to you or your partner’s work situation? How much of your decision is impacted by tax? Tax law changes regarding property (negative gearing) and shares (franking credits and capital gains tax) could occur at any point in time. Consider your lifestyle, whether or not you have dependents and the kind of area that would be best to live in. Buying a property in an area with access to desired facilities such as public transport and schools may not always be immediately affordable. Can you commit the required time to maintain a property? Personal values and situations affect your decisions about opportunity costs and risk appetite for investing decisions. Social pressure can push individuals into making choices that are not best suited for them, even though these choices may have worked out well for others. Rather than buying property to live-in, some people buy property as an investment to rent out. This brings another whole other set of potential advantages and disadvantages. Two of the most common are negative gearing and landlord costs. Investing in property or shares both have their advantages and disadvantages. Below are some factors you may want to consider before making a decision to invest in either. – Peace of mind and stable place of residence. – Easily bought and sold. – Regular income from dividends. – Not a physical asset. – Generally more volatile in the short-term. – Lack of correlation with other asset classes and good protection against inflation. – Easy to gain exposure to the entire index of thousands of companies to reduce risk. – The entire market can also have periods of weak performance. – Able to borrow more and leverage returns which can be great during times of low interest rates. – Higher repayments if interest rates rise. – No leverage means you can’t lose more than you invested. – Interest rates typically have less impact on share prices. – No benefits of higher leverage during periods of high growth. – Potential for negative gearing benefits. – Potential for franked dividend benefits. – Transaction costs and fees can be low. – Involves very little ongoing effort after an initial investment. – Capital gains tax when shares are sold. Please keep in mind that this report provides general advice only and doesn’t consider your personal circumstances. You should seek advice specific to your personal situation before making any financial investment decision. Chris Brycki is the Founder and CEO of Stockspot. Stockspot is Australia’s leading automated investment service which aims to make investing transparent, low cost and hassle-free. Stockspot was selected in the 50 Best Financial Technology (Fintech) Innovators globally by KPMG and named Asia's most innovative new financial technology business of 2014. Chris has also been named in the Top 35 Influencers of Financial Planning by Adviser Ratings.